NB/Fourth St. @ Gandy Blvd. SB/Fourth St. @ Gandy Blvd. EB/Fourth St. @ Gandy Blvd. NB/Fourth St. @ 54th Ave. N.
SB/Fourth St. @ 54th Ave. N.
NB/Fourth St. @ 22nd Ave. N.
SB/Fourth St. @ 22nd Ave. N.
EB/Fourth St. @ 22nd Ave. N.
SB/34th St. @ 38th Ave. N.
EB/34th St. @ 38th Ave. N.
WB/34th St. @ 38th Ave. N.
NB/34th St. @ First Ave. N.
EB/34th St. @ First Ave. S.
SB/34th St. @ First Ave. S.
NB/34th St. @ 22nd Ave. S.
SB/34th St. @ 22nd Ave. S.
EB/66th St. @ 38th Ave. N.
SB/66th St. @ 38th Ave. N.
NB/Tyrone Blvd. @ 66th St. N.
EB/Tyrone Blvd. @ 66th St. N.
NB/66th St. N. @ 22nd Ave N.
SB/66th St. N. @ 22nd Ave N.
The red light cameras are to be maintained by American Traffic Solutions(ATS) and the violations are reviewed by the City of St Petersburg Police Department. The contract with ATS was approved by the City of St Petersburg City Council in April 2011. The cameras are scheduled to go live September 15, 2011 issuing warnings for 45 days and then they started issuing official civil citations on October 29, 2011. The City of St Petersburg will give no grace period(time between when the light turns red and when they might issue a citation), meaning that if you cross the stop line 0.01 seconds after the light turns red you will get a citation. Fourth St. @ Gandy Blvd. Fourth St. @ 54th Ave. N.
Fourth St. @ 22nd Ave. N.
Sixth St. @ Fifth Ave. S.
34th St. @ 38th Ave. N.
34th St. @ First Ave. N.
34th St. @ First Ave. S.
34th St. @ 22nd Ave. S.
66th St. @ 38th Ave. N.
Tyrone Blvd. @ 66th St./22nd Ave N.
For more information on the contract between ATS and the City of St Petersburg and the $99,000 consultant report, click here. In September 2011, the city sent a flier out in all water bills, click here to see the flier and our response. 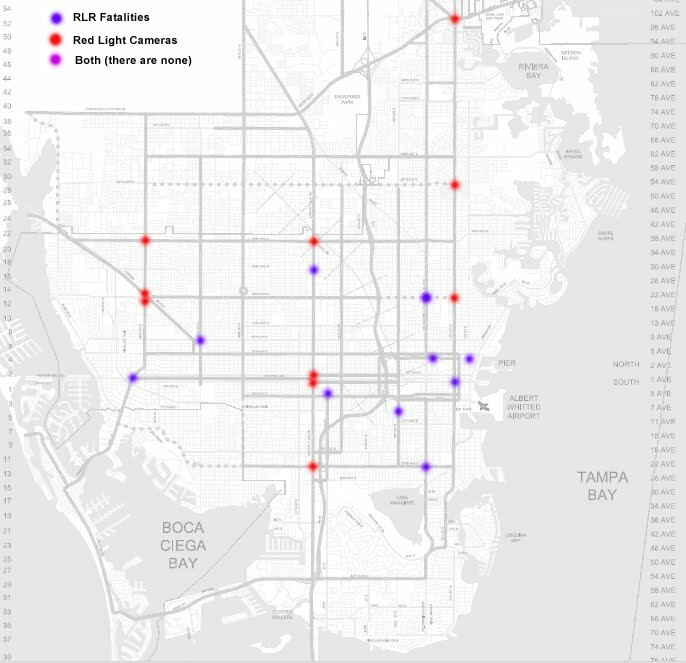 Here is a map of the red light camera locations in St Petersburg(in red) along with the reported red light running fatalities that have happened in the city within the last 3 years(2008-2011) in blue. NOTE: none of the locations chosen for red light cameras have had any red light running fatalities in the last 3 years.